10513-10 London Life. “Votes for Women.” Rotary Photo, E.C. 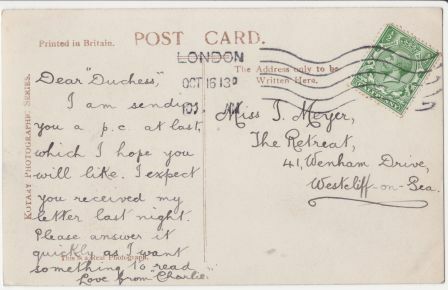 According to Crawford, the Rotary Photo Company issued at least three ‘London Life’ suffrage postcards, two of women selling The Suffragette (1) this image; (2) a woman, identified as Jeanie Sheppard, in a horse-drawn cart; and (3) a woman being arrested (identified as Mary Phillips). The woman in the image is wearing a ‘Holloway brooch’, a ‘brooch of honour’ designed by Sylvia Pankhurst for women who had been imprisoned in Holloway Prison. The brooch shows “a portcullis symbol of the House of commons, the gate and hanging chains in silver and the superimposed broad arrow in purple, white and green enamel“ (Crawford). According to the Museum of London it was first awarded to ex-prisoners at a demonstration at the Albert Hall on 29th April 1909. A photo of the Holloway brooch, can be seen at the Museum of London. 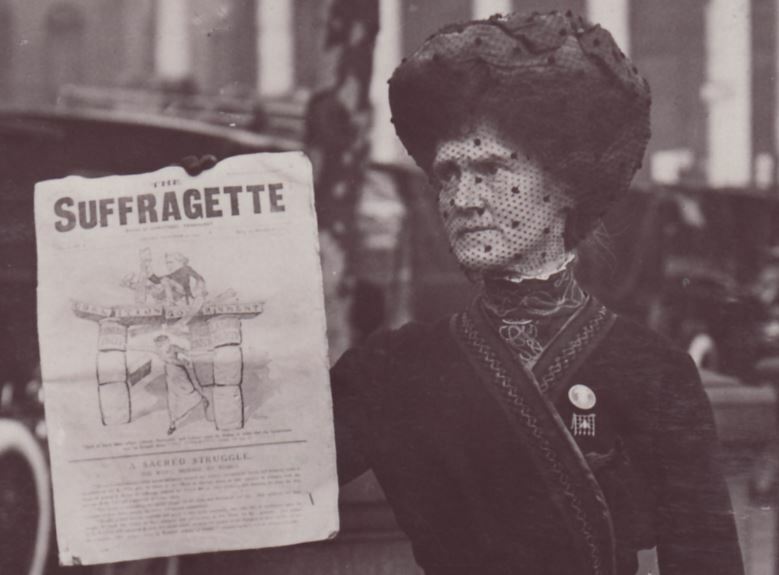 The newsletter ‘The Suffragette’ was published by the Women’s Social and Political Union (WSPU). 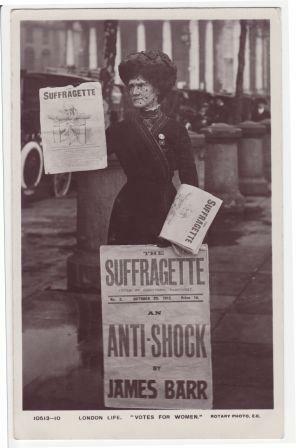 It replaced the earlier ‘Votes for Women’ newsletter in 1912 following the ousting of the Pethick-Lawrences. The issue which is on display in the photograph (No. 2, October 25, 1912) may concern an important letter by written by James Barr to the Prison Commissioners (below) in which he describes the force-feeding of Rose Howey in Walton Prison, Liverpool in January 1910. Prior to this letter the official position on force-feeding was that it was done in order to save lives however Barr’s letter makes it clear that Howey was not at risk when she was force-fed. A copy of the letter from James Barr is available at Nerve.